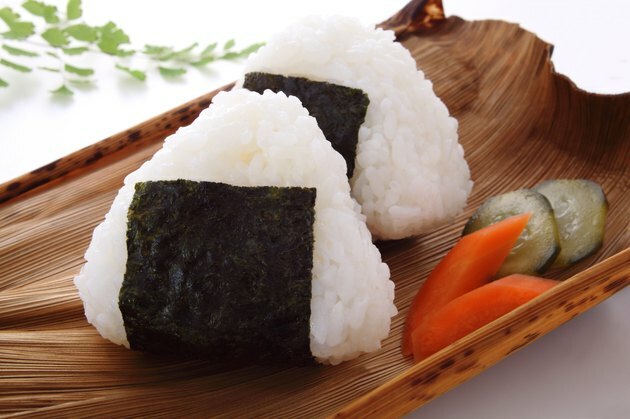 Rice balls, or onigiri, are multipurpose, portable snacks. Thought to have originated in Japan, the balls, squares or molded patties of cooked rice often appear in lunch boxes and Asian fast-food outlets. Once the rice is cooked, you can stuff the rice balls with condiments or other fillings. Vegetarian fillings are options that contribute additional nutrients and enhance the taste of the rice balls. Traditional rice balls use salty fillings, but you are not limited to salt-laden choices when you make your own rice balls. Small pieces of pickled vegetables add interest and a salty taste to rice balls. The options depend on your own food preferences. Spicy kimchee from Korean cuisine and chow chow from the American South are similar vegetable options, both based on cabbage. Pickled baby corn, pickled okra, green or black olives and capers are ready-to-eat filling options. Remember to drain them thoroughly before filling the rice ball. Grill grated carrots, onions or asparagus with ginger or garlic. Dice and mix them for a savory filling. Pickled or raw daikon radishes, wasabi and horseradish are spicy options for the adventurous. Pickled plums often appear as a filling in traditional Japanese rice balls. Mango chutney or kuchela are spicy, pickled fruit options that are good alternatives to plums. Consider dried fruit such as chopped dates, apricots and pineapple for sweet rice balls. Dried or pickled figs create a flavor and texture contrast to the rice. Tofu, miso and sweet bean paste are protein-rich vegetarian substitutions for rice ball recipes that normally use fish or chicken. Drain the tofu thoroughly before adding it to the rice ball. Miso and sweet bean paste are naturally salty, so reduce the amount of soy sauce or salt in your recipe when you use them. Sesame and sunflower seeds and nuts also boost the protein content of rice balls. Toast the nuts first and chop or grind them before adding them as a filling. Although short-grain white rice is the most commonly used variety for rice balls, brown rice also works well in this snack. The main consideration for any type of rice is to prepare it with enough water to make it sticky, but not soggy. Mix brown rice or wild rice with white rice for a healthier snack with more fiber. To decrease the sodium content of traditional rice ball recipes, use low-sodium soy sauce or prepare the rice in sodium-free vegetable broth.